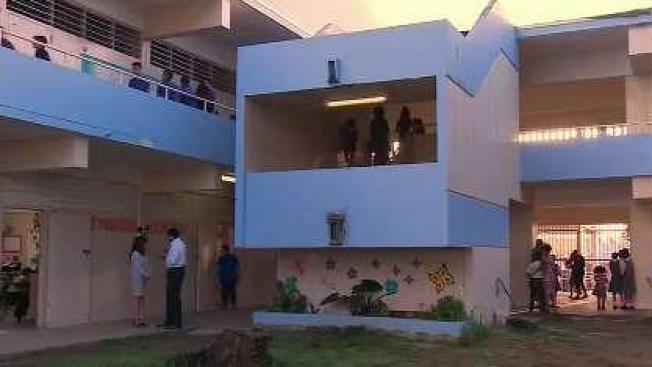 Puerto Rico announced it will close 283 schools this summer due to an enrollment drop. Puerto Rico's Department of Education announced Thursday that it will close 283 schools this summer following a sharp drop in enrollment amid the island's long economic slump and the continued departure of families after Hurricane Maria. Education Secretary Julia Keleher said there would be no layoffs, with teachers and other employees being reassigned to other schools as part of a fiscal plan that aims to save the department some $150 million. The U.S. territory currently has more than 1,100 public schools that serve 319,000 students. "We know it's a difficult and painful process," Keleher said. "Our children deserve the best education that we are capable of giving them taking into account Puerto Rico's fiscal reality." Keleher said that enrollment has dropped by more than 38,700 students since just last May and that nearly half of the schools are using only 60 percent of their capacity. After the closures, 828 public schools will remain operational. Keleher said she has invited mayors in the island's 78 municipalities to propose new uses for the shuttered schools. The announcement of closures came two weeks after Gov. Ricardo Rossello signed a bill for implementing a charter schools pilot program in 10 percent of public schools and offering private school vouchers to 3 percent of students starting in 2019-2020 as part of an education overhaul. Aida Diaz, president of a union that represents some 30,000 teachers, said she and others would fight the closures. "The damage that the Secretary of Education is doing to children, youth and their parents is immeasurable," Diaz said in a statement sent to The Associated Press. Yolanda Rosaly, an Education Department spokeswoman, did not immediately return a message for comment. Those who oppose the closures say they worry about transportation logistics and the needs of special education children. An estimated 30 percent of Puerto Rico students receive specialized education, twice the average on the U.S. mainland. The drop in enrollment comes as roughly a half million people have fled Puerto Rico for the U.S. mainland in the past decade during the long recession, including an estimated 135,000 since Hurricane Maria in September. Puerto Rico closed 150 schools from 2010 to 2015, and last year announced it would be closing another 179 schools.